I just saw this on VentureBeat. MySpace has added video to their mobile site, m.myspace.com. Thanks to MySpace’s original association with bands and music, it has tens of thousands of videos, especially music videos. It makes sense to make them available on mobile. I took a look at the mobile video offering and it is live and it works but it’s very limiting and not particularly user friendly. First you have to have a “compatible” phone. I couldn’t find a list of what MySpace considers compatible so I used Firefox’s User Agent Switcher to impersonate a number of phones. I confirmed that MySpace will let you watch videos on the Nokia N95 and N80, LG Voyager, Motorola RAZR2 V9, Samsung Instinct and Blackjack II. I’m sure there are other supported phones but among the dozen or so User Agents I tried those were the only ones that MySpace enabled the video link for. Notable video capable phones that MySpace doesn’t currently support include the Nokia N73, AT&T Tilt, Motorola Z8, Sony Ericsson Z750a, the original BlackJack, iPhone and T-Mobile G1! You have to have to be logged into MySpace mobile to watch videos. This is one of my pet peeves about MySpace mobile, you have to login to do anything. The full version of MySpace is very open and has many areas that are fully searchable and usable without logging in, including almost all the music videos. Logging in on a mobile phone is a pain especially with MySpace which uses (hard to triple tap) email addresses as IDs. You can only watch videos that you have previously uploaded to MySpace or have flagged as favorites in the full-web version of the site. This combined with the login requirement kills discoverability. Google search returns links to MySpace videos but you can’t view them on mobile, even if you are logged in, because you never added them to your favorites. I bet MySpace will lose millions of potential mobile users by these stupid restrictions on mobile versions of content that is wide open on the full web site. 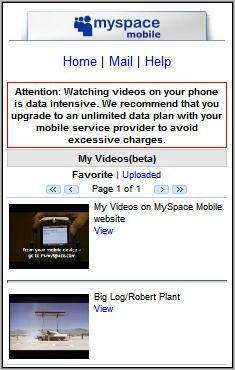 Perhaps I’m being too harsh with MySpace mobile video, after all it is a Beta. I’m sure more phones will be flagged as compatible soon and sharing videos on MySpace will become popular with YouTube members. But MySpace is in decline as a social network. They need to reinvent themselves and the MySpace video catalog gives them a great opportunity to do that both on the web and with mobile. If MySpace really wants to succeed in mobile video they need to look at what YouTube has done. I haven’t seen any numbers on mobile video market share but my gut feeling is that YouTube is the leading mobile video site by a wide margin. YouTube is popular because of brand name recognition plus discovery and interoperability. Every video on the full YouTube site can also be viewed with any any video capable phone. Even better, the mobile and PC versions of YouTube videos can be accessed from a common URL, so every video linked in a blog post, on Twitter or found by a search engine is instantly available on mobile phones. MySpace has great name recognition and I bet it could quickly become one of the leading mobile video destinations if MySpace followed YouTube’s example and opened up mobile videos to all phones and users and also automatically served mobile formatted videos to mobile users who followed a link to the full version of a MySpace video. WapReview Blog – My Space Mobile Is Live! This entry was posted in Video and tagged mobile site review, mobile usability, Social Media, Video by Dennis Bournique. Bookmark the permalink.